Like other architects in Norfolk, I tend to receive a lot of enquiries from homeowners at the start of the year – and certainly this January has been no different. If anything, it has been busier than ever, with potential clients calling and emailing to discuss possible projects for their homes later in the year. This is undoubtedly a great time to be thinking ahead and considering that extension, conversion or new garden studio. You may be discussing adding a conservatory, orangery or garden room to your period property or perhaps converting your garage into a leisure or work space. Your potential extension might be one or two-storey – or you might be mulling over the idea of a loft conversion or adding an extra floor to your bungalow. Now is certainly the time to do all of this. After all, by the time we agree a design and obtain planning permission it already takes us into June…. And, of course, builders and contractors are as busy as ever so it is worth thinking ahead now if you are hoping to complete works by the end of the year. I’m always surprised at the diversity of projects I’m asked to be involved with but this is what keeps my job exciting. This week alone I’ve been consulted about converting some old barn buildings into a dream man-cave, complete with gymnasium, shower facilities, study and recreation space. I have also been asked to look at low-spend solutions for re-modelling a Victorian terraced house to make it more suited to the owners’ modern day lifestyle. Ongoing projects are also moving forward at a pace – we are currently progressing through planning with an extension to a beautiful thatched cottage in South Norfolk. Parts of this character building date back to the 15th century and so any work needs to be sensitive to its unique heritage. I often find that consultation with planners before submitting a full application is a good idea, particularly where an opinion is needed on a controversial aspect of the design proposal. This is something I do on behalf of my clients where we think it necessary – but anyone interested in finding out more themselves can do so here. Any early advice can be factored in as the design evolves and it removes some of the uncertainty when a full application is submitted. 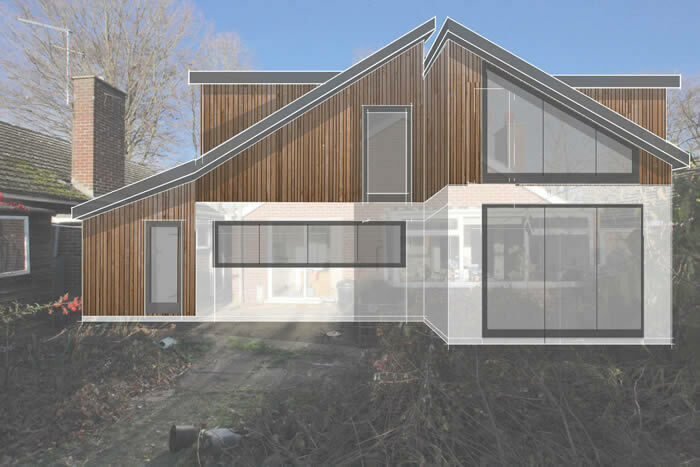 This is the approach I took with one particular client who wanted to extend upwards, adding a new floor and raising the roof height of an existing bungalow in Norwich. The planners were able to advise on the position of windows and dormers, and this has been taken on board within the submitted application. Design challenges come in all shapes and sizes – and that is what I love about my job so much. No matter how big or small, your project is always of interest to me and whatever the potential problems are, we can usually find a solution.